ErezNet Review 2019: Is ErezNet a Good Hosting? Established in 2007, ErezNet is a web hosting provider based in Israel. The vendor offers shared hosting, VPS, and dedicated server solutions to SMEs and large business enterprises in Israel. ErezNet has been in the web hosting business for over 12 years. The company is based in Israel and offers shared hosting, VPS, and dedicated servers hosting. In addition, the vendor offers an array of internet services that include web development, graphics and design, and SEO, among others. ErezNet hosts more than 20,000 websites with a data center located in Israel. 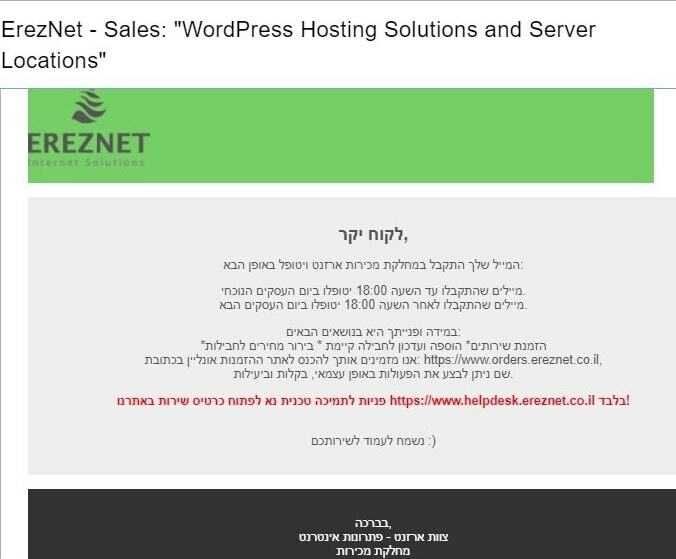 While at first glance it seems that the ErezNet website is available in Hebrew, Arabic, Russian, and French, a closer look reveals that it is only available in Hebrew; links to the other languages are inactive. ErezNet’s servers are housed in a modern Tier III facility and run on hardware from leading manufacturers such as Dell and IBM. The vendor uses dual network provisioning as well as several server protection systems designed to protect the websites it hosts from potential attacks or failures that would result in downtime. It provides secure and reliable hosting solutions operated on RAID 10 SSD cloud servers. The use of SSD storage ensures that the websites it hosts have faster loading speeds. ErezNet’s shared hosting solutions are categorized based on the operating system in use: either Linux shared hosting or Windows shared hosting. The most basic package under Linux shared hosting includes 150MB SSD disk space, 150GB monthly bandwidth, one domain, and unlimited email addresses. The most basic Windows shared hosting comes with slightly lower feature offerings yet it costs significantly more. Indeed, unlike the premium Linux shared hosting solution that comes with an array of unlimited features, the vendor’s premium Windows shared hosting plan still include significant caps on its feature offerings. ErezNet also offers cloud server rental services where users can choose either SAS-based servers or SSD servers. This server rental solution includes a data backup service with Disaster Recovery Planning (DRP). Other hosting solutions from this hosting firm include Magento hosting, Drupal hosting, Forum hosting, Joomla hosting, and WordPress hosting. ErezNet offers snapshot data backups with a simplified restoration process – just a click of a button. Each backup is stored for seven days. The hosting provider allows you to synchronize your backup to your FTP server at an extra fee. ErezNet’s web hosting solutions are competitively priced. The vendor offers flexible monthly billing cycles and its prices are listed in Israeli New Shekel. The hosting company has no money-back guarantee but offers an uptime guarantee of 99.9%. You can reach ErezNet via telephone, email, live chat, or ticketing system. Its support team is available 24/7. My attempts to get in touch with this vendor proved futile. I sent them an email and got an automated response with an explanation regarding the timeline I should expect as part of the vendor’s process of responding to customer queries. However, the vendor did not live up to this standard it has set for itself. A week later I was still waiting to hear from them. ErezNet has established a fairly detailed knowledge base which you can use for support on your own. ErezNet appears to have the hosting infrastructure to handle businesses of all sizes. Its array of hosting solutions are specially designed for different types of online businesses. However, with just one data center in Israel, it is hard to imagine that the vendor can comfortably and effectively host websites for businesses outside Israel. Wondering how ErezNet stacks up against other Web Hosting companies? Enter any other Web Hosting company and we will give you a side-by-side comparison.